Through a series of software management tools called Host PowerTools, Infinidat provides both system and application administrators with a new, advanced generation of storage management capabilities. Host PowerTools are used to maximize ease-of-use, ensure configuration readiness, and enable self-service of routine storage operations. It enables different IT teams to work together more easily. Download the Host PowerTools data sheet. Automating the host configuration process, according to best practices, reduces the risk of downtime, reduces manual labor, and shortens configuration time. Host PowerTools enables the administrator to securely authenticate only once. Host PowerTools fully automates this entire LUN provisioning process, on both the storage and host sides, using a single, user-friendly GUI and CLI. Increase an existing LUN size or provision a new LUN through Host PowerTools. Both tasks are available through the GUI and the CLI, and take just a few seconds to complete. Host PowerTools provides a clear, real-time configuration status of all available LUNs on each system. Show end-to-end mapping between host and the systems. 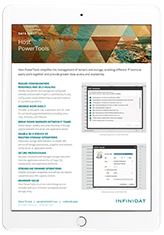 Host PowerTools further enables administrators to test the performance of a specific LUN, to ensure it is performing well. Host PowerTools offers a consistent management experience, with identical GUI and CLI across multiple operating systems, while still preserving the unique capabilities of each OS (such as file system types). This unique feature simplifies the administrator’s work and boosts productivity.